Motherhood is truly amazing and the most important role you will have in your life. But it’s also not all rainbows and butterflies. It’s really really H A R D, especially during that 4th trimester. Like most first time moms, throughout my pregnancy I did a lot of research about having a healthy pregnancy and about birth, because birth is crazy and the hardest part, right? As difficult as birth is, there’s so much more that’s ahead, and you’ll be able to make it a little easier on yourself knowing that you’re not alone and learning some tips before you become a tired and stressed out new mom. So take some time to read about what you can expect becoming a first time mom and take solace in knowing that you’re not alone. So many mothers have been exactly where you are. Feel free to ask any questions in the comments below, and for all you mothers reading this please leave the biggest thing you wish you knew in the comments below. It really does take a village and we’re all in this together. This post isn’t met to scare you, but it is meant to help prepare you for what’s in store as a first time mom. Motherhood is a crazy ride. Raising the next generation is the most important thing you will ever do. It’s also the hardest thing you will ever do. Each day brings on new challenges, and with one little smile and laugh, they’re able to melt away all of life’s stresses. It took 9 months to grow a human being. Then within hours or days that human rips through you to enter this world. Birth is a very traumatic event on the body and is exhausting both mentally and physically. You need to be patient with your body. It needs time and love to heal. Give it rest as much as you can, and then move it when the time is right and the stitches have healed. It’s going to feel squishy and have marks it didn’t have before. Those marks show you how you were able to create and grow a little human. Have love for those marks, be kind to your squishiness. Don’t expect it to “bounce back” within weeks or even months. You will love more than you ever thought possible, but it doesn’t come right away. Of course when you meet your little boy or girl you love them immediately, but for many, it’s not all fairytale love from the start. You will likely feel protective from the beginning, but as the days pass your bond continues to grow and out of nowhere, you will feel this intense love and connection that you never thought possible. It’s truly amazing the capacity for love that a mother has for her child, but if you don’t feel it right away you’re not alone. It’s actually really common and will come with time and bonding. Your hormones will continue to fluctuate long after giving birth. As a first time mom you may have thought you’d be done with the crazy mood swings and crying that came with pregnancy, but that’s not going to be the case. Following birth, your progesterone levels will plummet which causes the “baby blues”. You will likely be just as crazy, if not more crazy for a few weeks. With the plummeting hormones comes sadness, hair loss, and irritability all while navigating your new role as a parent. This generally continues to a lesser degree until you get your period and things start to regulate again. That being said, these symptoms should only last for a few minutes or hours and start to dissipate. 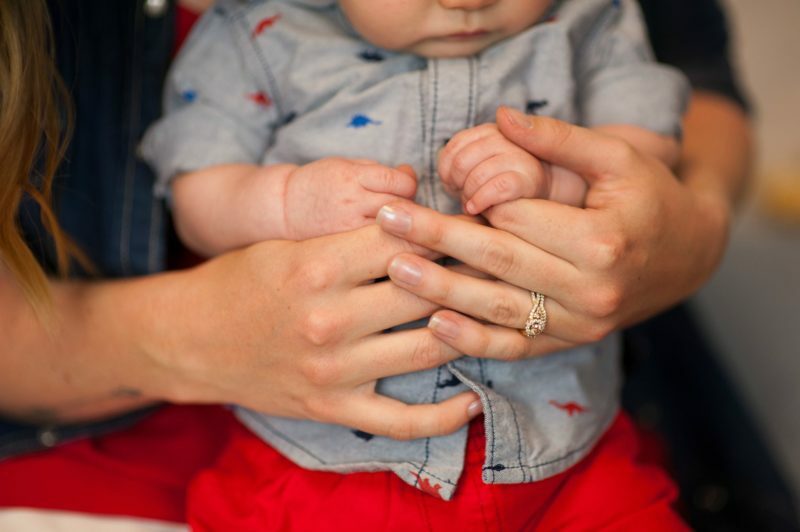 If you’re feeling severe symptoms and starting to withdraw, and/or have thoughts of self harm or harm for your baby, you could be dealing with postpartum depression and should seek out medical support. There’s no escaping postpartum hair loss. During pregnancy women’s hormones shift so that more of your hair is in the growth stage. You have likely experienced your hair growing faster than usual and coming in thicker, hello goregeous Disney princess hair! Then with the drop in hormones, all of that hair that was in the growth stage enters the resting stage and begins to fall out, yikes! Generally this happens at the 3 month postpartum mark, but can happen anywhere between 0 – 6 months. The more your hair flourished during pregnancy, the more you tend to lose postpartum. It is completely normal to have huge clumps of hair come out everytime you wash or brush your hair. Rest easy knowing that it does grow back. It may be depressing to see it all coming out, and you may get funny hairlines, but it will dissipate, and it will grow back. My friend Avery has a great blog post about how she dealt with postpartum hair loss. Eventually, your partner goes back to work, the family visits get less and less, and you end up being alone with your babe for most of the day, every day. There is no off time, and your partner will likely have a tough time understanding what you’re going through. Your relationships with friends who don’t have kids may start to drift apart. You may like the idea of going out and meeting people, but you also may be held back by the anxiety of leaving the house with your new baby not knowing when they may start freaking out. People say not to worry, babies cry, but you probably won’t want to be that person with the crying baby that won’t be quiet. Take solace in knowing that all moms know what you’re going through. Find connections with local mom groups. Confide in private mom Facebook groups like the welcoming one I’m an admin of, 4 Moms. Stroller walks are great first outings because most babes lie there content or fall asleep. Eventually going out gets easier. The isolation and frustration will always come and go, but when you have a tribe of moms around you it gets easier to pull yourself back out. Your plans for parental roles probably won’t go as planned. While I was pregnant I thought I had it all planned out. We would both take turns comforting our new little bundle, and my hubby would take night shift once a week. None of it worked out that way. After 9 months of being carried by mom, she becomes the main source of comfort in this big strange world. Everything is so new and scary, but the sound of moms heartbeat is safe and reassuring. Dad can take on a big role in comforting baby and helping with night shifts, but it takes a lot of work, and most Dads end up feeling helpless and defeated when they aren’t able to comfort baby as quickly and easily as mom can. As time goes on the mom and baby bond grows strong making it take consistency and persistence for anyone else to comfort baby. Slowly over time your little baby will be less new and feel more comfortable in it’s new world. Your partner will be able to bond with and comfort your baby as they grow and become more fun. You may be able to achieve your plans eventually, but likely it won’t be right away, and it also may go completely sideways. Take time to research baby sleeping needs before the baby is here. This one is huge! It’s so important to learn about breastfeeding and sleeping needs before you have the baby and are sleep deprived and caught up in learning how to survive with your new little bundle. Generally, there is a lot more support for breastfeeding than sleeping, and good baby sleeping habits are more important than you may think. In the beginning, you’re just trying to survive. You will likely think that the baby will sleep when it needs to, and you’ll probably spend lots of time rocking your baby to sleep, then half the time the little bugger will wake up as soon as you put them down. The more sleep deprived they get, the crankier they are throughout the day, and the harder it is to get them to sleep. If you can take the time to research baby sleep before your little one is here you can learn how much sleep they need so their little brains can develop and so you have a happier baby throughout the day. You’ll also learn about good sleep associations and how routines can help so your baby will fall asleep easier taking a lot of stress off of mom. With implementing these good habits you’ll also be given some alone time and relationship time during those naps and before bed! Being a new mom is like being thrown into a exam & not knowing any answers of half answers on the test! I’ll never forget the tough couple of months although I felt I had it a lot easier than other moms so I stayed pretty quiet about struggles with Lucas, hormones, etc. However, postpartum hairloss.. Thats another story! I lost it all over & its all growing back and if I have my hair in a pony you can see all the sparse new hairs in the back to the front! Thank you for this post! Especially the part that you may not feel “fairy tale love” right away and that a bond and connection WILL form over time. This is true for mamas and dads and can be a source of a lot of (unnecessary) guilt. I love how you mention in this post that “we are raising the next generation” because we truly are! 🙂 Its important for us mamas to stick together and share what we know and have learned through our own personal experience. I am pretty happy with how everything turned out 🙂 It was over whelming at times, I remember the first couple months I didn’t want to drive anywhere with my little munchkin in the back, except for doctors appointments. I wish I had meal prepped before my LO’s birth date! It would have been so nice to have quick and easy healthy snacks and meal set aside for anytime I needed them. I'm also happy I did a bit of meal prepping but I wish I did more!